Dearborn, Mi. 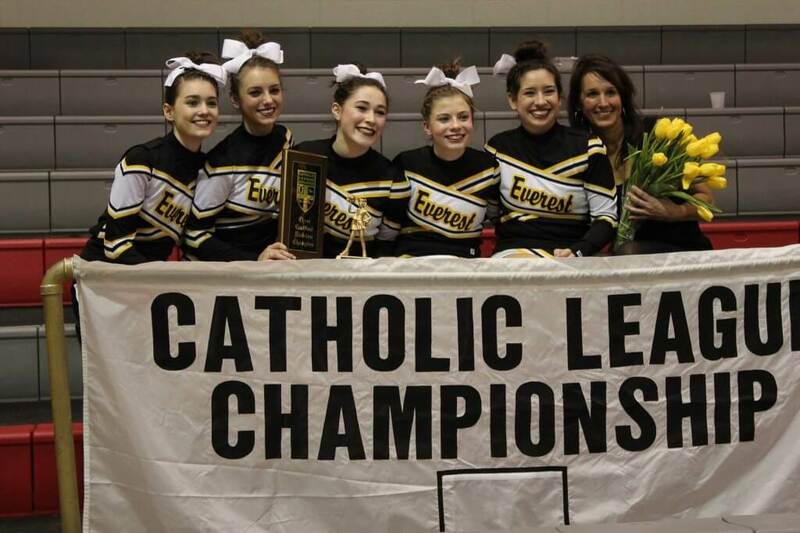 – In 2012 EC’s Head Competitive Cheer Coach, Nancy Burgess decided it was time for her sideline cheer team to become a competitive cheer team. She never imagined her team would experience success as quickly as they did. In 2013, the team captured the school’s first ever C-D Division Catholic League Championship and followed that success with a District title. This past Sunday, Burgess’ squad captured their second CHSL Championship. Even though the victory in 2013 was exciting, winning the championship this year with only 5 cheerleaders was very gratifying. Trailing by over 20 points heading into the final routine, the Everest Collegiate Mountaineers performed a near perfect routine to edge out St. Catherine of Siena 627 to 624. Leading the way for the Mountaineers was senior Monica Toohey who was honored by the coaches as an All-Catholic selection. Rounding out the team was Senior Hannah Burgess who was honored as an All-Academic selection, Senior Monica Lis-Planells, and Freshmen Catherine Ireland and Katya Dominguez. The Mountaineers will compete again this Saturday, January 31, at Lansing Waverly High School.